A few weeks ago I reviewed the Colossus and I’m still impressed by the little beast. Mojo Hand FX has got me hooked and when they recently released a pedal that not only sported familiar graphics but also promised to capture David Gilmour’s tone, I just had to check it out. Here’s my review of the Iron Bell. The Iron Bell is housed in a MXR-sized box with a bright status led, true bypass switching and it runs on either 9V battery or a Boss-style adapter. The pedal feature controls for volume, gain, tone and colour. The first three are pretty obvious, while the Colour control allow you to sculpt the frequency of the tone control – much like a mid range booster, although a bit more subtle. To say that the Iron Bell is “Gilmour-in-a-box” is perhaps not fair. Of course, it takes much more than a simple stompbox to recreate his tones. But that was never really the intention either. The Iron Bell is designed to capture the vibe and feel of Gilmour’s tones throughout the decades. Since the early 70s, David has always paired his distortions with boosters and overdrives. From the Fuzz Face and Colorsound Power Boost combo to the classic Big Muff and Tube Driver setup, his tones has always had that powerful edge to them. 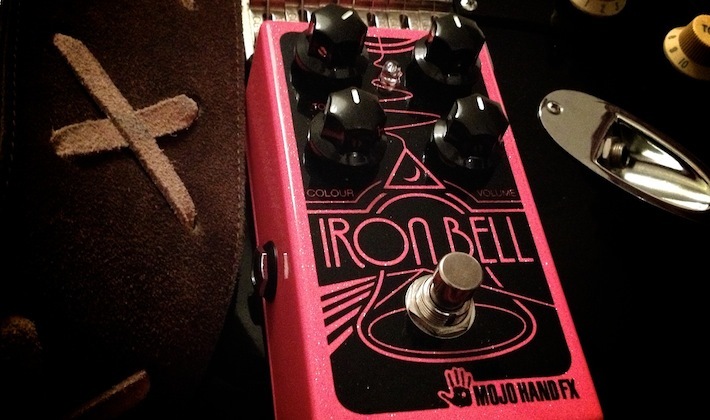 The Iron Bell isn’t based on any particular pedal but it definitely got a Big Muff flavour to it. It’s got the bright, aggressive top of the Ram’s Head, the fat lows of the early Sovtek models and the creamy, saturated gain of the RAT. If you do need a reference, think of a mix between the Cornish P2 and G2. The first clip in the video, is an attempt at the Animals ram’s head and Power Boost combo. By maxing the gain, leaving the tone at noon and rolling off the colour, you’ll get a bright, aggressive tone with an amazing sustain and attack. The second clip, demonstrates David’s more recent Big Muff and Tube Driver combo as heard on the 2006 On an Island tour. By increasing the colour for a bit more mids, you’ll get that familiar, throaty tone. The last clip, feature the Iron Bell set up as an overdrive, typical of the smooth Division Bell Tube Driver and P90 pickups tones. Even with the gain rolled down considerably, the Iron Bell produce a creamy and warm tone. So how does it compare to the Colossus? Well, while the Colossus is based on the Sovtek Civil War, with a dark, thunderous tone, the Iron Bell has much more gain and sustain, a brighter top and considerably less lower end. I also think it’s a bit more versatile than the Colossus, being capable of more than just the typical Big Muff tones. They both serve different purposes. The Iron Bell can be paired up with a booster but personally I think it sounds best alone, with perhaps only some modulation and delay. What I especially like about it, is its ability to maintain its sustain and attack even at the lowest gain settings. Increasing the volume, also enhances the compression and smoothness. The Iron Bell also works nicely on bedroom setups and low volume levels. Mojo Hand has done it again! Check out the Iron Bell if you’re searching for a versatile Big Muff-ish distortion that’ll provide a wide range of classic tones. Highly recommended! Visit mojohandfx.com for more details. The Iron Bell was tested for both stage and home setups with a Reeves Custom 50 and a Laney CUB12 with both single coils and humbuckers. Now I’m using a JHS Angry Charlie v3 for my leads and for hi gain rhythm guitar but I miss the fat low of the big muff and some raspy highs. Do you thin the Iron Bell would be a good alternative? I use a stock Vox ac15 c1. You’re describing the classic issue with vintage style fuzz pedals. They all have very little mid range and compression, which is what you need to cut through that band mix. Your Vox amp has very little mids and compression too so this might not be the best combination for the tones you need. Vox and Fender amps require pedals with more mids and compression, while fuzz and Muffs often work better with Marshall, Hiwatt etc much like what Gilmour and Hendrix did. So in layman’s terms…The “Colour” knob turned counter-clockwise will scoop the mids, and when turned clockwise will boost them? Thanks so much Bjorn! I just noticed that even with the colour knob at 5:00. It’s still just a subtle mid range boost. Is the boost suppose to be subtle? Or may it be my Fender amps lacking in the mids? (83 Concert Rivera 1×12 & 98 Hot Rod Deluxe 2×12). It will be more noticeable on more mid rangy amps but yes, it is subtle. That’s kind of the point. Once you crank the mids you turn the Muff into something else. Is it necessary to use any BD-2 Boss and Compressor (maybe Joyo) with the Iron Bell? Or is it ok use only Iron Bell + modulation + delay? I’m just a bedroom fan of David Gilmour with a mexican strat and a transistor amp (Hiwatt G CMR 50). Do I need to sell my boss OD-3 or replace it for a Mooer bues mood or o Joyo (OCD)? Thank’s a lot for you information! The Iron Bell is designed to sound like a Muff being stacked with a booster, so yes, it can operate alone. i cant decide between this and the vick audio 73 rams head …. would do you like more for the animals/the wall tone? The Ram’s Head is closer to the Wall/Animals stuff but it depends on what kind of amp you have. The Ram’s Head prefer an amp with lots of mid range and some compression, while the Iron Bell is a slightly more versatile pedal, with a more amp-like character. HI Bjorn ! great review. just a quick one! is that volume at round 2 o clock at unity volume? I have a BRUNETTI SINGLE MAN combo 35w. with the iron bell volume at 2 o clock i have almost 3 times the clean starting volume. I don’t really remember but unity volume or flat volume different from pedal to pedal. Hi Bjorn, I currently use a Wren and Cuff Caprid for all my Gilmour needs but the size is becoming an issue on my pedalboard. I mainly want to get David’s Pulse, The Wall and Animals tones. Will the Iron Bell get these tones? Based on a conversation we had via the comment section for your Musket Review, I ended up purchasing the Iron Bell and I’m happy to report that it truly is a great pedal — The Cleanest/Smoothest Big Muff I’ve had the chance to play and yet there is so much gain on tap. I have been able to tame the pedal as needed for chordal progressions but you are certainly 100% right that the Iron Bell shines for lead tones. I find that it compliments my Barber Gain Changer and Dyna Comp. The Dyna Comp usually just stays on but on occasion I turn on the Gain Changer which acts more as a boost and sits just before the Iron Bell in the Chain. If I have the Gain turned down on the Iron Bell, the combo of these two pedals brings some articulation to the backdrop of fuziness. My usual method is to use the Barber Gain Changer for rhythm work and light overdrive and then switch to the Iron Bell for the leads. Thanks again for this site and time given to share your perspectives and insights. Hey Bjorn! I love your reviews, and they have helped me a lot! Current I’m trying to build a board that’s inspired more by Gilmour’s most recent rig. At first, I thought about getting a Rat as an equivalent to the Cornish G-2 and a Musket for the P-1. However, now I’m feeling like I could use the Iron Bell for my g-2 tones and the Colossus for my P-1 tones. What do you think? I think I read that the G-2 has a Ratt-y inspiration but I know the G-2 is sort of it’s own thing, like the Iron Bell. If I were to be honest, I tend to like Gilmour’s Pulse, DSoT, MLoR, and Division Bell era most. I figure I could get the job done with those two Mojo Hand pedals. What do you think? Any advice? Thanks for all you do! Hey great site! I just ordered this pedal based on your review, can’t wait to get it. As far as putting it into my pedalboard how will this work out after a buffer? I know some fuzz’s don’t like a buffer in front of them. I ordered one based on this review. I could not be any happier with the pedal. I’ve gotten so many different tones out of this, that I’m considering getting another one just so I don’t have to fiddle with knobs between songs. Yes you’re right, the BYOC sounds really authentic (i noticed if i crank the gain knob it opens to the fuzz territory well) and I can play most of the Floyd stuff very close to the records with your help! The problem is the reliability of the footswitch when I play with the band and the boomyness, so sometimes I can’t hear what I’m doing lost in the mix. I like the tone of the muff, but i’m looking something much useful in the rearsal room! As Chesire, I own a BYOC triangle beaver that i think is too boomy for my taste. Do you think the Iron Bell goes well near a RAT o maybe you would consider another Muff, Musket perhaps? As Chesire I’m looking for much versatility! Great review as always Bjorn. I already have a BYOC Beaver Triangle version and its very good at some of these tones but the Iron Bell seems to offer more versatility. Is it a quiet pedal and how did it feel with the DG20s? Hi Bjorn and many thanks for making it clear in my poor mind :) BTW the AnalogMan BC 108 maybe a better choice than the BC 109 for a home setting, don’t you think ? A good choice would be the Analogman Sun Face BC109 I guess. I play a US Strat with DG pick-ups : I installed a loaded black pickguard with the Black Strat pick-ups set. My home set is a Blackstar HT5 (Head+Cab). I found this pedal on the second hand market some months ago, before seeing your review and I am very pleased with it. I am such an ignorant with pedals that I didn’t realize I can consider it like some kind of Muff :D But it make sense (- well… of course !!!). Thanks for sharing your huge knowledge and congrats for the great playing ! I am considering adding a fuzz to get closer to some DSotM / WYWH chorus tones, do you agree ? Which Fuzz would you choose ? Should I place it before or after the I.B. in the set up ? Thanks and greetings from Paris ! did you findï»¿ the same two things? I just got an iron bell my self last week, and I’m thrilled with it. About four years ago I bought a EHX reissue Big Muff and was totally unimpressed with it. When I bought it I didn’t really know a lot about Muffs and I just knew that guys like Gilmour and Cobain used them. So I ended up being very disappointed with my Muff because it was so muddy and I couldn’t get a decent tone out of it unless I turned it up loud and risk upsetting the other people living in my apartment building. So basically that experience led to give up on Muffs all together. Then I started following your website several years ago and I discovered the very interesting history of the Muff and the ever expanding market of Muff Clones. The past two years I’ve been trying to find a Fuzz /Muff pedal that sounds good to me. As some one who lives in apartment it can be challenging to find a Fuzz that works well at bed room tones. Thanks for helping make sense of the complex creature that is the Big Muff and all the clones out there. I know that I love the Iron Bell and I have finally found an amazing muff that sounds great in my set up. MIM Strat w/humbucker>Drybell VM>sunface bc183>OCD(overdrive)>EHX deluxe EM>Boss DD-20(just added on Thursday. Awesome!!! )>Fender Blues jr./Hot Rod Deluxe (depending on location). It will be used for bedroom level/150 seat venue max. which makes me lean towards Iron Bell. My favorite Gilmour tone is probably Comfortably Numb/On the Turning Away. Sorry for the long-winded post. By the way, been listening to Airbag a lot lately. Your music blows my mind! Waiting someday for someone to make “Riisish.com”. Thanks for the info on the L series, likewise, you may want to give the Ruby EL34BHT a try, that’s what Bill thinks sounds best in his amps, ither than NOS tubes he sells at a premium, and he switched to the BHT’s from the JJs, so just a suggestion. When I’m ready for tubes, I’ll try the JJ EL34L, and give you an idea about the difference, unless you try the Ruby,( Shuguangs), first! uses as his stock tubes in the REEVES Custom series, Ruby EL34 BHT, which all the tube sites rate very highly. I just thought it interesting that you mentioned anything other than JJs. I love my JJs, and when time comes for outies, I’m going to see if their is much difference between them and the Shuguangs. That may be the volume difference I spoke about in an earlier post about 3 o’clock not being nearly stage colume for me on my REEVES. I have one of these Iron Bell pedals on the way from Prymaxe and a Laney cub 12r combo on the way also mostly in thanks to this demo. I really, really like the second and third tones you got in this demo. The second tone was thick and had authority, The third is probably what I’d call the tone from heaven. Man it sounds good. I know I won’t sound this good right away with it but it’s going to be be fun getting there. I like my Fender twin for playing time on with the bc109 analogman and a lot of the other songs my band plays that sound great on a fender but I agree it is a bright amp for stuff after dark side. I’m excited to try the Laney out, I had a friend offer me a used Reeves 50 custom PS and just can’t do that right now hoping the Cub will deliver for me. Also curious about the cub 8. Have yo utried one of those yet? looks like a cool little practice amp if it is Gilmourish or not I don’t know? Just wondering of the Iron Bell would be as suitable as the Colossus for Black Keys sounds? Just wondering if you had tried the Mojo Hand Rook Royal OD. I just saw some Youtube vids and it sounds pretty awesome. If not, you should check it out. Not sure how Gimoury it is, but it is worth a listen. BjÃ¸rn, I’m very impressed about your page and also about your demos. Congratulations for such an amazing work and thank you for sharing your expertice and knowledge with us. I have a couple of questions related to the Iron Bell. Im using a MIM Strat with the ssl-5 ,cs69 and 50s and a line 6 spider lV. Thank you very much for inspiration!!! What are the other pedals you Used to achieve the sound? Except the iron in what other things you used for the animals “rams head” ? you think the Iron Bell For me? How would you compare the Iron bell with the Pig Hoof? Is the Pig Hoof still your favourite Muff clone or has the Iron Bell taken its place? Great site and reviews, always a pleasure checking in. I currently own a fuzz factory which is really versatile but touchy with its settings. Would the Iron Bell be duplicating too of the same tones or a good additional fuzz/muff/rat? Bjorn could you put backing track used for this video? Thanks for getting back to me Bjorn & for your helpful advice! I know I’ll end up testing both these pedals very soon & will let you know how I went ok. I’m sure they’re both gonna be nice, would be super if I could grab both :)… In the meantime take care mate & I’ll be looking out for more awesome happenings here on Gilmourish! :). Thanks for getting back quick ! Received my Iron Bell from the States after a 6 week wait. Absolutely brilliant pedal, and for anyone in two minds I can’t recommend it highly enough. I’m even tempted to order a 2nd as a back up. Your review is spot on Bjorn. What muff would be best for wall/final cut tones ? Just ordered a mojo hand colossus, being a total muff newbie. Would that be appropriate ? Or better a eqd hoof or iron bell ?? Hiya Bjorn, Hope things are going well with you & the band ! 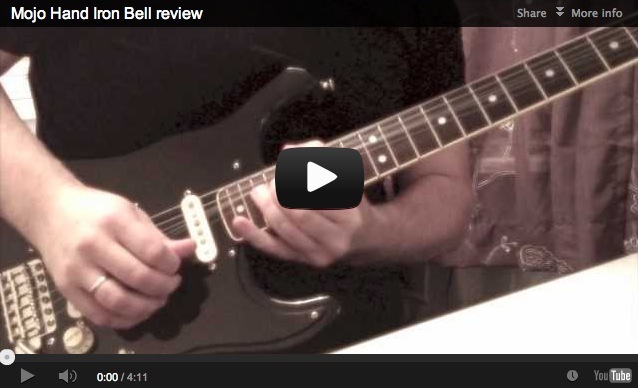 Superb job with the review for the Iron Bell, it sure sounds like a fantastic versatile little pedal :). I’m currently waiting to try one out within next few weeks since the shop that stocks it is still waiting for shipment to arrive, a bit of a drag I guess. Wanted to personally thank you for giving us fellow musos & Gilmour fans your honest & in depth opinion each time you do a review, and for showing us a good clear contrast between what each pedal/gear is expected to do. I myself haven’t had the pleasure of owning a true Muff, which is why I’m keen to get one that sounds great. I have a Skreddy Lunar Module which I absolutely love & have a boutique Rat clone type which is decent sounding too. As for my sound preference I love Gilmour’s tones from Meddle/DSOTM, which I can achieve with the Lunar Module very well and his more current ones especially Gdansk/Island. I love that edgy, grainy tone, even more so than Pulse. I know you did a brief review of the Wren&Cuff Box of War, but I’m wondering have you ever had a look at their Tall Font Russian? Apparently they did a ton of work on it to achieve that mighty green Muff sound. Judging by the sound clips it looks like an awesome pedal that lives up to the original & with some quality refinements. It’s supposed to be not as boomy/bassy sounding as the BOW, has more useful tone control in terms of controlling that “muddiness” & sounds smoother too to my ears. I’m just picturing how great would be to play C’numb & On the Turning Away on it :). So I think for me its probably going to be a choice between these 2 pedals. How do you view the Green Muffs? Do you still use yours? I remember you posting an awesome clip of it previously. As you said the Iron Bell is not a true Muff but has some of its genes. I’m just after achieving a nice authentic tone that’s also versatile. Many thanks for the help & for the superb work you do to keep Gilmourish a great source of inspiration! Cheers! I put the Iron Bell on the pedal board yesterday and i reckon it will have a permanent place. Not often you try a peddle and are mightly impressed from the first chords and notes. I put the settings you used and loved them all. I reckon Gdansk to the Division bell settings will be most prominent. although to be used sparingly. Bjorn, just a quick Thank you for putting up with my incessant posts. I don’t do it to monopolize the site, I just love the site so much, and as you know, read it during every single mornings Zen time. Because I’m on here so much, if I think of something, I post it. I hope no one minds, if so, please feel free to tell me to shut up!LOL I, like most here, have had a life long love affair with David, and PF, and there is so much more I’ve learned since finding Gilmourish, and on a rare occasion, I think of something I feel may be helpful. I’m just Learning To Fly! Thanks again for taking the time to answer all my questions. I just got my Iron Bell. The first time I tried it at extremly low volume it was OK. Then I used at practice with alot of volume and it came alive. I can not get over how much gain it has. This is my first fuzz type pedal and I finally have found the creamy tones I was looking for. I almost got the Big Muff PI with tone wicker before I found your site and your awesome reviews. Your site is now one of my favorite places for tone research. Thanks for sharing your gifts and knowledge with us. Hi, bought this one after your excellent review! I’m not so good at recognizing DGs fuzz tones from different eras. So, could you recommend some settings on the Iron Bell for different periods? Hi Bjorn, just one question, is the pig hoof still your favorite Gilmour pedal or do you have another favorite? Thanks Bjorn… I think I’m gonna stick with LB. I may pick up Iron Bell in a few months. I loved the review. The only problem is now I’m on the fence over which pedal I should order. I have been looking at the BYOC Large Beaver but after reading your review I’m having second thoughts. I mostly play through a 62 Bassman clone I built but I also sometimes use a Hot Rod Deville or Peave Classis 30. I liked the fact that you mentioned that this pedal is very versital and can be used at any volume. I currently use a Jam Pedal Red Muck in my pedal chain, which I love, but its just missing something for me. My pedal board has a MXR Dyna Comp, Red Muck, BD2 or BK Butler Tube Drive, Carbon Copy. So I guess my question is do you think the Iron Bell would better fit over the Large Beaver? Or maybe a different pedal. Thanks for all your AWESOME work on this site, you keep me thinking and playing. @ Nick Veekens, thanks for the heads up on the power supply, so I figured I’d return the favor on the TSA15H, and matching cabinet. For a home practice amp, I don’t think there is a better tube amp out there. It eats pedals, and is very loud for 15, or 5 watts, dead silent, and stick a set of jjs in the pres, and outputs, and you have an awesome little monster. When the 30 watt combo, and niw head came out, I went crazy, and immediately bought the first TSA30COMBO SAM ASH had in stock, but found that unlike thr very well made 15, the tube sockets were not mountex to the chassis. I had the first 30 for 6 months before it died, the second 30 died after 2 hours, and the third 30 was bad at the store when I went to pick it up. It’s really sad, because before the first 30 died, I was so impressed, the additional mids knob, and added gain stage, plus 30 watts being close enough to gig with because of the amps unlimited headroom made me absolutely rave about the amp. But you know the adage, if it seems too good to be true, it most likely is. I have not checked if the 30 watt head has chassis mounted tube sockets, but if it doesn’t, I would make sure you could get your money back if it has problems. However, my 15 is still as good a 15 watt amp as I’ve heard, great clean headroom almost to full volume once the jjs are installed, and because it’s cathode biased, you don’t have to bias the amp when you change thise outout tubes. Bjorn I’m sure will give a fine review of these amos, but I’ve gad the 15 for 18 months, and it’s bulletproof, but three 30s in seven months, and the first lasted six, you be the judge. Can’t go wrong with the 15 imho! Hope my precautionary tale was okay Bjorn? Well, that settles the matter! Thanks for your input. I may fall for a true Muff one day (and the Iron Bell sure sounds great), but for now I’ll choose the RAT. Thanks also for pointing out Prymaxe’s demo of the BD-2 clone, which I missed. From what I’ve heard, I must say that I prefer the Hustle Drive, so I’ll be getting it along with the RAT and see how they work together. Thanks again for being such an inspiring source of information. Hi Bjorn, first off, this has been such a wonderful site to follow over the years. Thank you for all of the hard work you put into it. Reading through this review, I think I am like many of the other posters who were going to buy something else until they read this! Based on the what I have been reading on your site I was sure I was going to buy a Musket, but now this Iron Bell has me second-guessing. I switch between a Deluxe Strat with Lace Hot Gold pickups and a PRS CS24 with humbuckers into a Mesa Boogie Mark V. For most things I am satisfied with what I get out of the amp, but I feel like something is missing trying to play DG’s stuff. So I thought a fuzz/muff pedal would help me get that saturated / compressed kind of tone at a bedroom level volume. I have an OCD that I have tried to use and it does help add something to the Mark V’s dirty channels. I am going for Wall (Comfortably Numb to Young Lust). If the pedal could cover early 90’s Smashing Pumpkins fuzz territory, that would be a bonus. I don’t have any way to demo these pedals, so any insight would be appreciated. Do I go for the Musket or Iron Bell(I do realize either of these would be most likely used with the clean channel)? Hi Bjorn, I’m begining with fuzz pedals and I’m gonna buy muy first one this week. Do you recommend this Mojo Iron Bell more than EHX little Big Muff Pi or EHX Muff Tone Wicker? I have a Fender Blues Junior and American Standard stock pickups, What do you recommend?? I like the EarthQuaker Hoof Fuzz too. Thanks a lot! Thanks for all your reviews and expert advice on setups! My Iron Bell is on order! Received the Colossus a couple of weeks back too! Looking forward to exploring the two of them! Hi Bjorn, and happy new year! Thanks for your answer to my question regarding amp sims. On this matter, I own Guitar Rig 5 Pro, but I’m hardly satisfied with it â€” I find that most of the time clean sounds are flat, distorted sounds too synthetic and that it often kills dynamics â€” nuances in the playing. It might sound great in a mix, but playing through it can be quite dull. One could argue that nothing is free and that the time spent tweaking can be highly rewarded, and I would normally agree, but I recently gave a try to several free plugins, and I was quite blown away. For instance, LePou’s LeXtac amp is amazing, and it’s now my go-to clean amp sim (yellow channel), combined with the free Marshall 1960A/Celestion G12M impulses from Redwirez (there’s plenty of room for experiments here). I usually add RAT and Tube Screamer simulations from TSE808 and Distorque Audio’s Vitamin C (Orange Squeezer sim) for compression. And I really rediscovered the way amp sims feel. Not only does it sound great, but it does so with little to no tweaking, while all the same feeling more alive, dynamic, dare I say organic (especially with a tad of chorus). If you have some time to try these out in the future, I’d be interested to know what you think about them. They might not be the best tools to precisely reproduce David’s tones, but I’d take a noticeably different but more alive sound over a flat carbon copy any day. And, after all, the tone is in the fingers (or at least a fair part of it), and the evolution of David’s tone show that change is not necessarily a bad thing. Anyway, back to more usual hardware matters. Being gradually transitioning from a computer setup to a real amp/fx setup, I re-read your Big Muff tone tutorial recently, especially the budget/bedroom section, and wondered how a RAT + overdrive would fare against an Iron Bell (or any other versatile Muff clone). From what I read, the first combo would be more flexible and, if the overdrive is transparent enough, it could also double as a boost for powerful (cranked) clean sounds, with or without a compressor in the chain. I read of your enthusiasm about the tiny Mooer pedals, and given that thay can be had for 55â‚¬ apiece from a British e-store, I am quite ready to pull the trigger on a Black Secret (RAT clone) and a Hustle Drive (supposedly OCD clone, but not quite â€” more transparent than a Tube Screamer anyway). Mooer also makes a Tube Screamer clone, but I think my guitars are middy enough (one with high output humbuckers, the other with an EMG DG-20, which I finally chose over a CS69 set); they also make a BD-2 clone, but I found no noteworthy review of it, while everyone seems to rave about the Hustle Drive (you can check the Prymaxe review to hear how it sounds). Finally getting to the point: with Pulse tones in mind, do you think that this would be an interesting choice (potentially well-sounding, versatile), over an Iron Bell, for a bedroom setup (in a cub12r amp) ? In spite of what you way about the Iron Bell, I have the feeling that the RAT + OD combo can cover more types of sounds and make for a more versatile (bedroom) setup, am I mistaken ? Hello Bjorn, as usual, I’m off topic, but didn’t know where to post. I’m getting really tired of hooking up my pedals everytime I play. I will soon have a secure practice space, but while still just playing at home, or at jams, I have to break my pedals down when not in use, so I’m going to start building a board. My question is: What is a very reasonably priced power supply that will handle all my pedals, all of them are 9v, except the Deluxe Mistress which is 12, or 18, (I don’t pay attention, just plug it in! hehe). I am B-R-O-K-E, thank you very much for giving me the disease called GAS! I still need a couple of pedals,(12 or 15 just aren’t enough), but seriously think a good, but reasonable power supply should be my next purchase. I’d also like to say that excluding my ramblings, the Gilmourish posts seem to be all so interesting, and filled with grest questions, even more than usual lately, which says a lot for all youâ€™ve done to inform your readers, even an old player such as myself! Hello, Bjorn. I’ve been a Gilmourish fan for several years. Really enjoy your reviews and playing. Love the Iron Bell review. I bought a BYOC Large Beaver last year, based on your review. Looks like I’ll be getting an Iron Bell soon, based on same. Also, I’ve been checking out the DigiTech Whammy pedal and wondering what you think of it … for soaring tunes like “The Blue,” etc. Keep up the good work! Hey Bjorn, I finally looked at the Caitlinbread site, and was amazed that it’s priced at $229.00US! That’s less than my DD-20. I can’t wait to find out if it’s all it’s supposed to be, because at that price, I’d be more tgan happy to get that huge DD off the board. Hope yours comes soon, I am anxious to see a review I know I can trust! You gave not steered me wrong yet. This pedal sounds completely fantastic. How does it sound with the Electric Mistress though? Does it play nicely or does it sound overly bright/warm? Completely off topic, but when are we getting the next Buyer’s Gear Guide? I’m looking forward to the updated budget guide (15 year old gilmour addict here). Hi Bjorn, happy new year! another very nice review… tkz! I get my tone with the proco rat white face and the ibanez ts9. I think that I need a muff/fuzz in my set. Considering that I already have a distortion effect with the rat + ts9, would you recommend add the Iron Bell, the Colossus, the Musket or the Large Beaver in my set to get all eras David Gilmour with these distortion pedals that I already have? which one muff/fuzz would be better in this case? Anyway, it’s always a pleasure just to hear your amazing tone and playing! My question: in your answer to Karst you mention that you’ve obtained great results recording with Logic some demos for your band. Which are the Logic name of project, amp sims, effects, etc that you mostly use with Logic? No need to say that it will never sound like the real thing, but I also use Logic to demo some drafts of songs since it’s much faster than the usual set up of amp, pedalboard and so on. Hey Bjorn! I see you have a review for the Alter Ego delay and in that you state how if there was to be a new echorec clone, that it needed to have a control for modulation. Well you’re in luck, Catalinbread just came out with their own echorec clone and it has a trim pot inside for modulation. Could you do a review for it? an iron bell is on it’s way…. my first big muff after 18 years of playing the guitar. i did build a clone a few years ago from some schematics but i don’t recall what type – it was silly how noisy it was. Excellent review and playing Bjorn!! So many great Muff clone reviews lately. Great sounds and they all have their own place. I have the Musket and I really like it, but I think I may have to pick the Iron Bell up and see how I like it compared to the Musket. Also Bjorn, are you still using GHS Gilmour Signature 10-48 strings? Maybe its just me but your guitar looks really easy and fun to play lol. My guitar needs a setup and fret level BAD so It’s something I noticed. Hi Bjorn, great review as always… I was going to buy myself a JHS all american…but now I want an Iron Bell… I was wondering if you tried the all american??? thanks have a happy holiday. Hello Bjorn! I hope you are doing well! I absolutely love the way you made this pedal sound. This year my mother told me she was gonna get me something for christmas wether I like it or not lol she said it might as well be something I really want or itd be more clothes T_T soo I said well there is this new pedal called the iron bell…lol So she got it for me. Cant wait to play it!! I have a North Effects Violet Rams Head, and a toptone DG-1, but I do believe this pedal will exceed both on the “Gilmourish” scale, and be more versatile than both. Im guessing this pedal handles a misstress and rt-20 with full distortion nicely also? I tend to use those two modulations alot now with my big muffs. Ive been using the rt-20 alot since I just bought it so I hope the Iron Bell sounds good with it. Im going for those Animal rotary tones and Wall/Final cut flanger tones. I can make it work Im sure :) Well, Im done babbling. Thanks Bjorn, I think I speak for everyone when I say that this website has helped us more than you can imagine! You are as brilliant as you are kind and helpful! I hope you and your family have a great Christmas this year! and God Bless! I love watching all your reviews just to hear you play! As the soon to be owner of a Laney Cub 10, I am really combing through your reviews trying to figure out which muff is best for me. I had pretty much settled on the BYOC Large Beaver until I saw this review. Now I am confused! What would your suggestion be for the Gilmour fan that could only afford one of these two fine pedals? The Iron Bell seems really appealing because you state a booster/ OD is not necessary. Wow this one sounds really good! I think Christmas may get a little lean at my house this year ;-) Great playing as well! I was wondering, do you use any other effects during the first and second part? Any delay or reverb settings? That C-numb tone is just to die for! Forgot to ask how well this cleans up? Thank you. Great sounding pedal, and great job playing Bjorn. You really have the Gilmour sound dialed-in incredibly good. How does the Iron Bell compare to the Musket? Bjorn Happy Holidays to you , your family and the Band. another great review. Where can we purchase one of these Bad Boys? david gilmour did most of his best work with just a few very common pedals. now he is a well educated and experienced (old) guitar player with perfect guitar technique and hundreds of the best and expensive gear parts you can grab. booster, one echorec (which most people used at that time) and an amp. Some days ago I saw a young man who must have spent a fortune on equipment. a gilmour-cs-guitar, every cornish pedal you can buy, a collection of jam pedals, two hiwatt amps and a lot more. He tried to do “echoes” and “shine on” … it sounded awful. Merry Christmas and many thanks for yet another outstanding review. Hey Bjorn, while I was posting the last message about an hour ago, I looked at yesterday’s mail, and my local big box music store catalog was there, I just started looking through it, and while I’m not a big Dunlop fan, they’ve just put out a 70th Anniversary Jimi Hendrix series of pedals, a MXR sized” same Dallas Arbiter circuit” , true bypass, bright LED, and awesome Hendrix graphics. The other two pedals may be garbage, but they claim to be the same circuits as Hendrix used, but all in the MXR size box. The Octavio, like he used at the end of Watchtower, for the outro solo, and a Uni-Vibe, and all it says is that it’s analog, and it says “Uni-Vibe” on the pedal. All three are $129, which is a great price for the Fuzz-Face, which is the only one of the three that I’d bet is the real deal. The other two, I’m skeptical, but maybe someone in the community will try them and report back. By the way, as I’m typing this, I got my Fedex notification, my speakers are 6 blocks away, and ready for pick-up, and the Strat should be ready by no later than Thursday. Finally, Whew, that was a long wait! Bjorn, I can’t put my finger on the reason, but wasn’t there a picture, and mention of this pedal a couple of months back? I seem to remember posting about Pink Floyd inspired graphics, and marketing techniques? Great review, another,”Bjorn made me spend it, sorry kids!” Pedal. Hehehe. First of all, SUPERB playing Bjorn. Is this a pedal you would say can effectively cover everything from Meddle to Gdansk? Or is if you could only own ONE dirt pedal (God forbid) what would you choose?? Wow, I think I might actually have to get this right now. That is spot on, and you are right it isn’t something you can pin down to a model. Oh and by the way the article was saying that they didn’t necessarily want it to be “Gilmour in a box” but rather to be in the spirit of what he did. Very nice playing Bjiorn! and of course thanks for sharing the info! Well, this is good news! By the way, is the Pigs backing track available somewhere, or is it something you put together for the occasion? Excellent review, thank you! How would you say this compares to the Skreddy P19? Thanks for this Bjorn, good write up! I am considering this for a small board I am putting together for Early Gilmour and Bjorn Airbag tones! Seems a cool and nicely realised pedal. Hi Bjorn, how do you think this compares to the Sunface Analogman B108/B109? The YouTube video of the Pink Floyd Time Solo / Sunface Demo by kitraefantasyart using the B108 really gives an accurate fuzz for the Time solo, bang on! Just wondering if this pedal can do the same! It’s becoming increasingly difficult to make a choice between all these muff clones. On the other hand, it’s always a pleasure to hear you demoing them! Do you think this Iron Bell would be a good choice if I want to nail Pulse-type tones (I’m thinking about the Sorrow solo), on a cub12r with cs69s in my strat? Happy hollidays to you and your family Bjorn from Sacramento California! How dose this sound with the.DG20 pups? I love my musket, but now im looking for another pedal to handle the earlier floyd stuff, do you think this would be a good choise? It seemed to handle lower gain settings beautifully without losing any sustain. Anyways have a great christmas buddy!